This is a perfect side dish to pair with any meal, lunch or dinner! I am not gonna lie, I ate this by itself for breakfast a few times because it’s just that good! The flavors are perfect for a Fall and Winter pallet, especially if you need a side dish for a Holiday dinner! This is super quick and easy and you can see below that I paired it with my Oven Baked Pecan-Crusted Dijon Chicken for a delightful dinner! 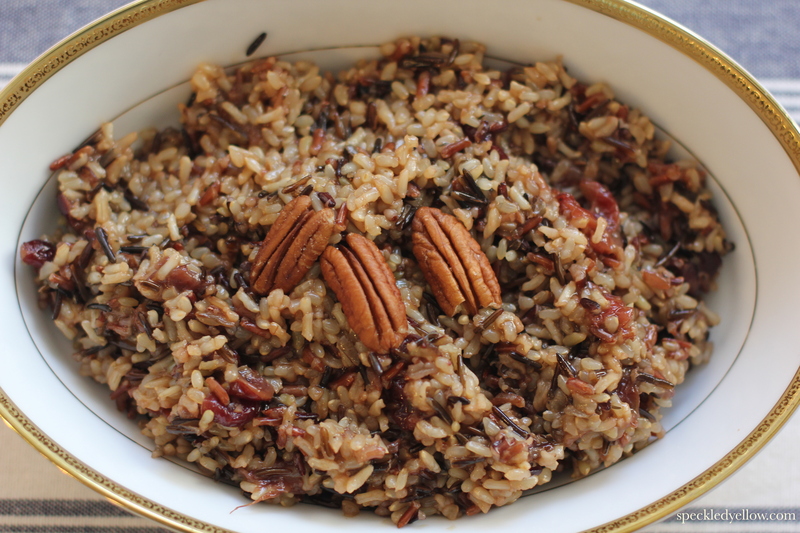 This rice pilaf dish as yummy dried cranberries in it, and I am a big supporter of dried fruit in anything and everything, so any chance I get to add some, I will! 2. Add the stock to a pot and simmer over medium-low heat. 3. In an over safe casserole or dutch oven melt the butter with the oil. Add the shallots and sauté until translucent about 2-3 minutes. 4. Then, stir in the stock, dried cranberries, bay leaf, thyme, 1/2 teaspoon of salt and 1/8 teaspoon of pepper. 5. Bring to a simmer, stir and cover. 6. Next, transfer the casserole or dutch oven to the oven and bake until all the liquid has been absorbed and the rice is tender about 40-45 minutes. 7. Make sure to remove the bay leaf and thyme springs, if used, when the dish has finished cooking and prior to eating. 8. stir in the pecans and serve! This chicken dish it the ULTIMATE, MOST AMAZING chicken you will ever eat in your life!!!!! I made this pretty much every day for a week straight and then I shared the recipe with all of my friends. 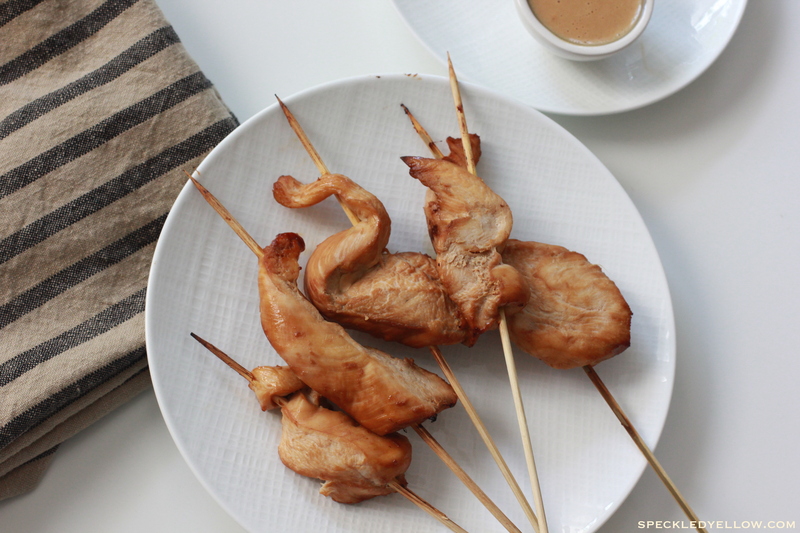 It is also a great dish if you are hosting a dinner party or having a friend or two over for dinner! I have also chopped up the chicken and put it on top of salad for a delicious chicken salad lunch recipe. 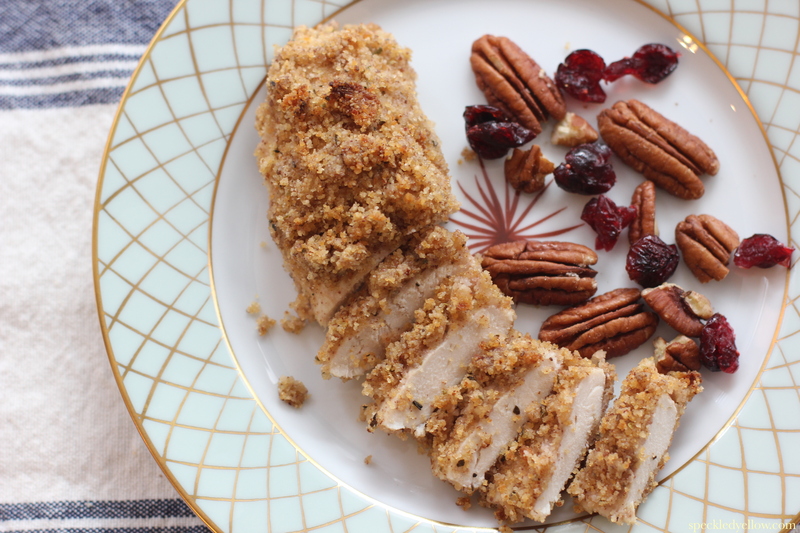 The dijon mustard keeps the chicken moist and adds delectable flavor, while the pecans and bread crumbs create a crispy crunch. 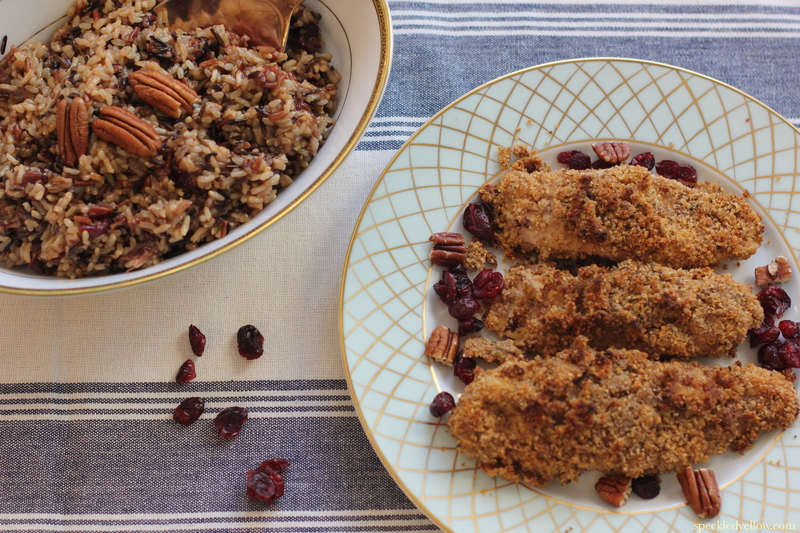 Sometimes I feel like I am eating a healthier version of chicken fingers! 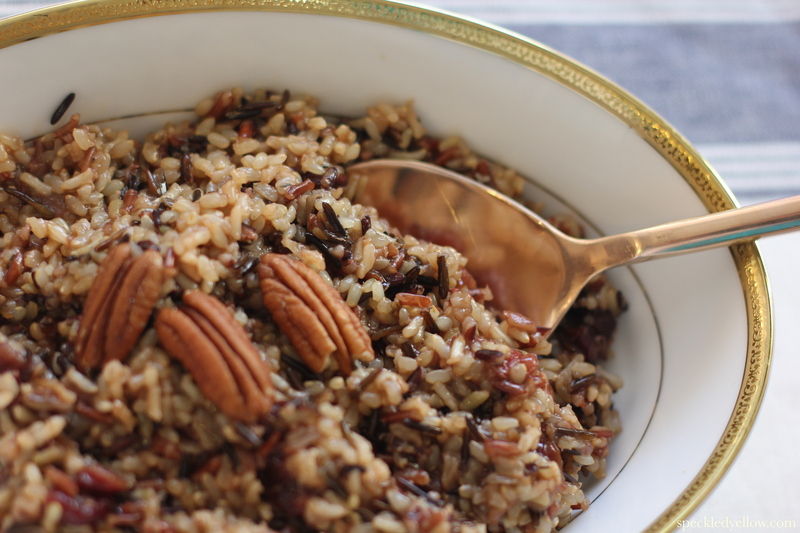 I paired this with my Wild Rice Pilaf With Dried Cranberries and Pecans which I will be posting next! 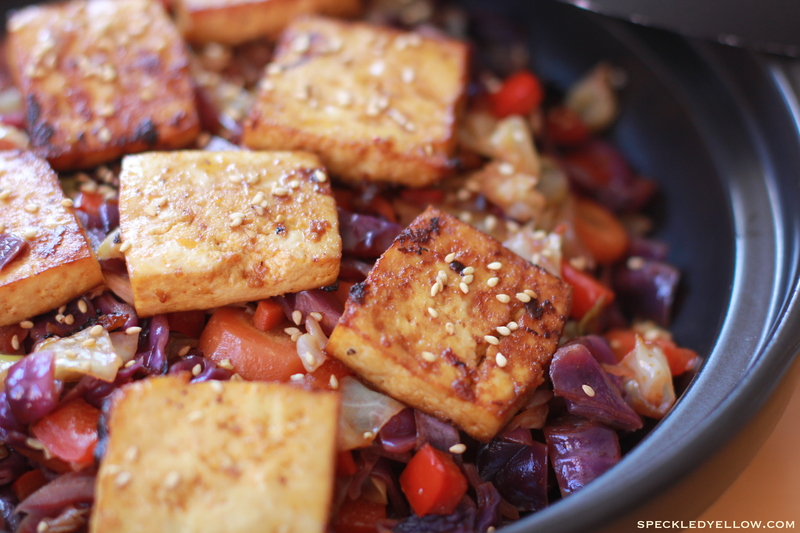 I can officially announce that this dish is a slice of tofu heaven! 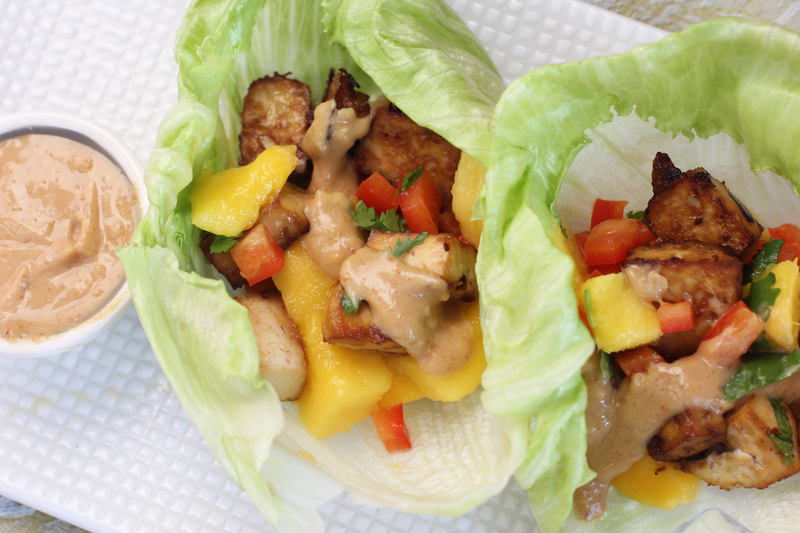 The past week, I kept seeing pictures of chicken lettuce wraps and then of course I started dreaming of chicken lettuce wraps. The delicious crunch of the lettuce and sweetness of the sauce; I just could not stop envisioning taking a massive delectable bite out of something sooo good but at the same time low carb! However, I had tofu and no chicken at home. Well not to worry, I found this recipe from an adorable blog called, Cookie + Kate. It incorporates everything you could possible want in a healthy meal and I give this a million thumbs up! 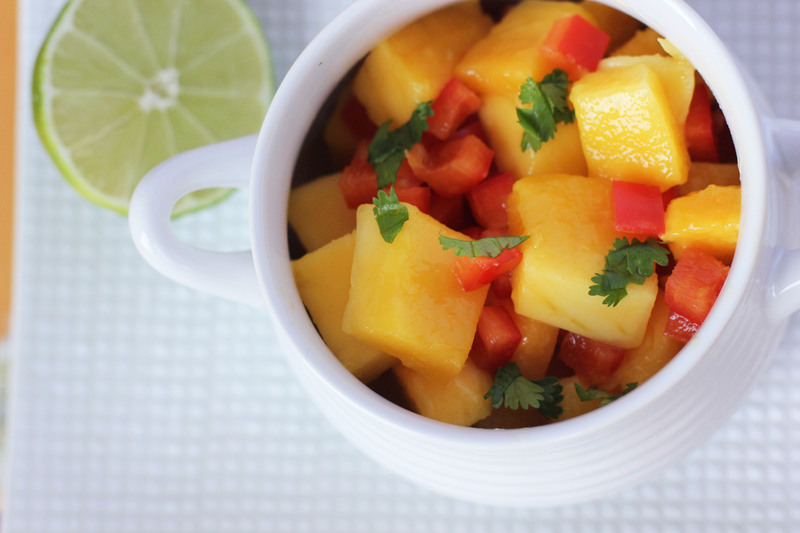 Though I have to admit it, I made this during the summer when mangos were in peek season and oh so delicious. But even though it is Fall, we can still have an occasional burst of some summery food to remind us that summer will come again…..not for a while, but it will someday return! 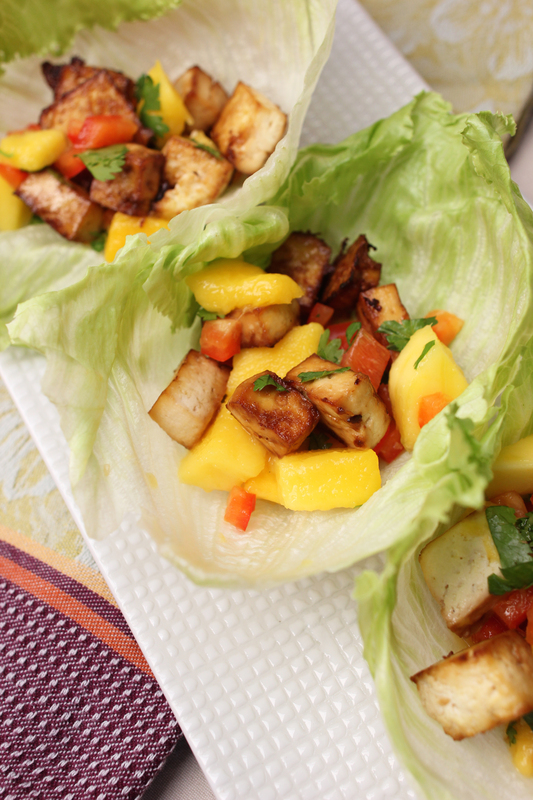 For now, this is a great light meal to have, especially if you have a tropical vacation coming up sometime soon! This is by far one of the best tofu dishes I have ever had!!! 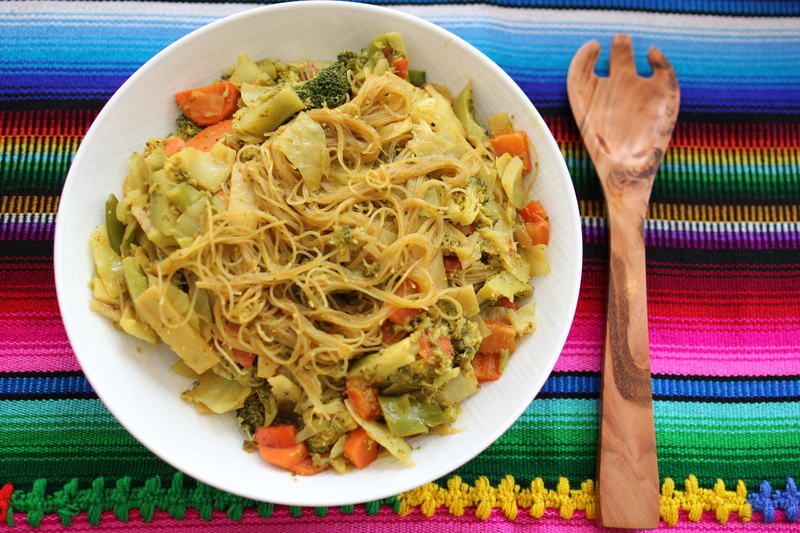 It has the perfect amount of spice and flavor to satisfy your belly, and I love how the cabbage-veggie stir fry creates a mix of vibrant colors! Also, fast fact, WebMD says that cabbage helps with stomach pain, morning sickness (calling all you pregnant ladies), and it’s also used to prevent weak bones and cancer! It’s one of the lowest calorie veggies and is packed with antioxidants and vitamins A and K!!!! Also, this dish is HUSBAND APPROVED! *Notes: Tofu needs to be marinated for 30-40 minutes. Preheat oven to 350 degrees f.
1. 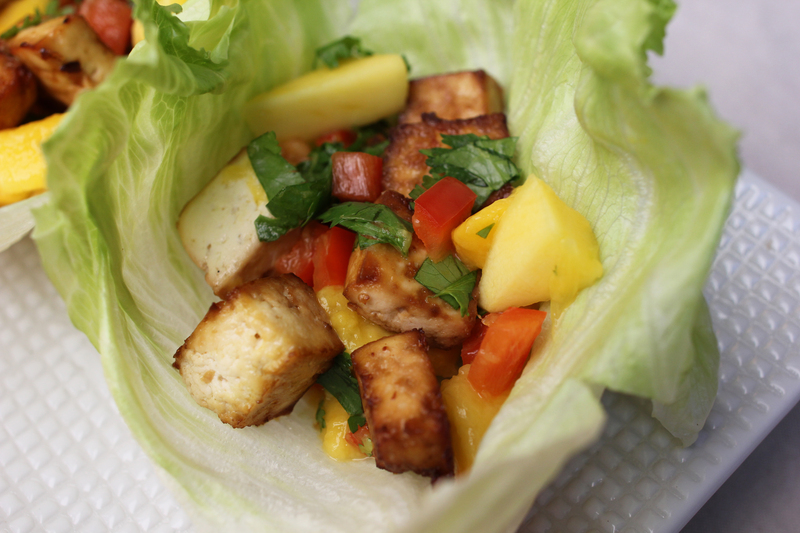 Open the tofu package and using paper towels and your hands gently press on the tofu and let excess water out. Do this until most of the water is gone. Slice the tofu into small rectangular shapes. 2. In a small bowl, combine the olive oil, hot sauce, tamari (or soy sauce), minced garlic, sesame oil, white cooking wine, and a dash of salt and pepper. Mix until blended. 3. Dip each piece of tofu into the liquid mixture to coat each side. 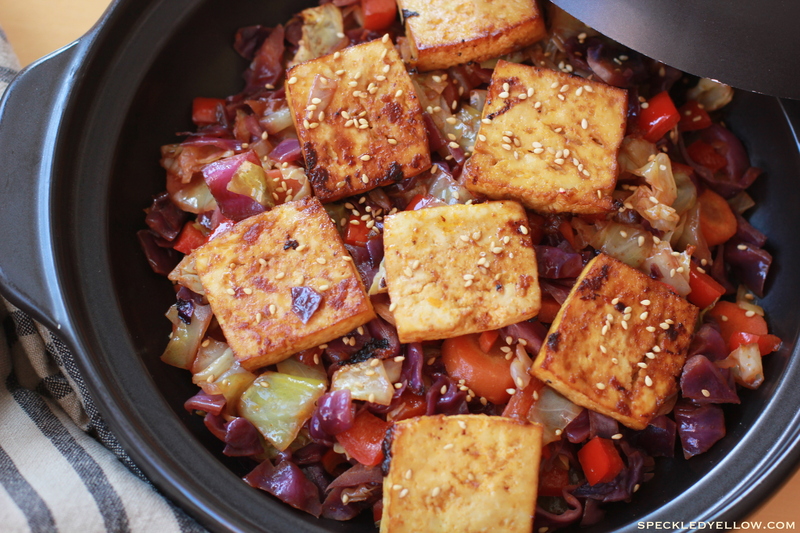 Then set the tofu aside in a separate bowl, adding any remaining mixture, and marinate for 30-60 minutes in the refrigerator. 4. Spray a baking sheet with nonstick cooking spray (I use nonstick olive oil spray), then spread the tofu out evenly. 6. Flip ’em over and cook the other side for 15-20 mins. 7. Place on top of the veggie mixture and sprinkle on some toasted sesame seeds! 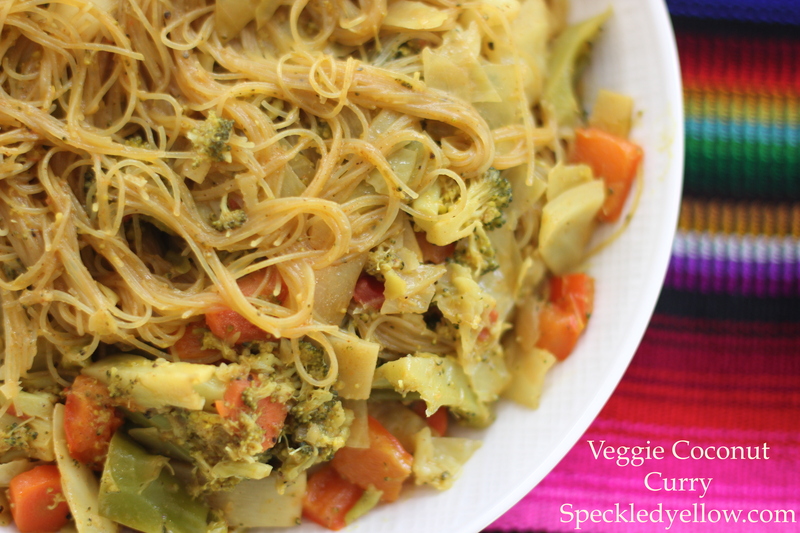 Cabbage Veggie Stir Fry Directions…. 1. Place all of the chopped veggies in a large bowl. 2. Mix the olive oil, smoked paprika, red pepper flakes, cayenne pepper, rice vinagr, and tamari sauce (or soy sauce) in a small bowl. 3. Add the small sauce mixture to the large veggie bowl and stir until the veggies are coated evenly. 4. Use a deep frying pan or stir fry pan and stir fry the veggie mixture on medium to medium/high heat until the carrots are semi-soft around 15/20 minutes. 5. Add salt and pepper to taste. 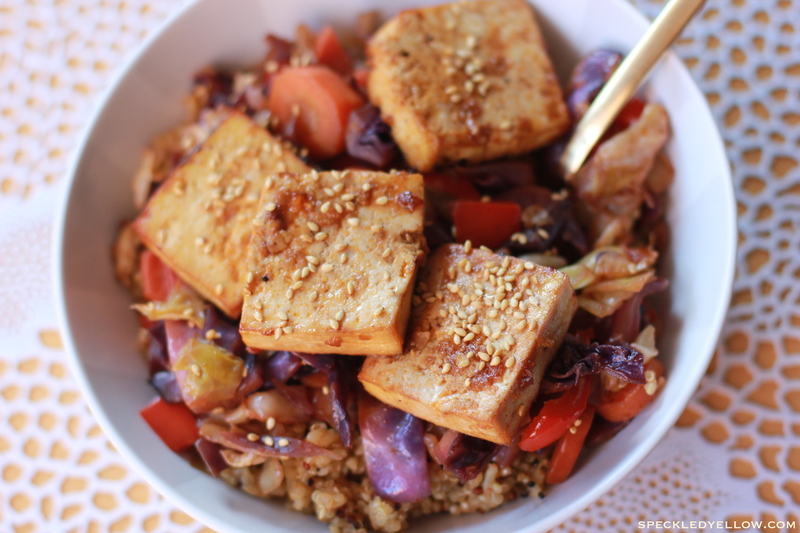 Serve alone with the tofu or over rice or noodles! 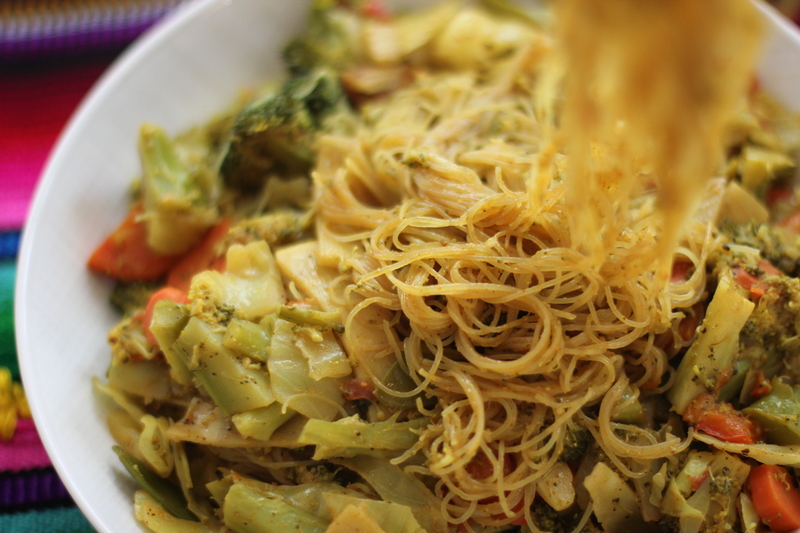 Recipe adapted from Divine Healthy Food (all vegan) . A must check out with delicious recipes!!!!!! So simple, easy, and fast! This wrap has become my go-to for a healthy quick lunch, and my staple meal for beach days, picnics in the park, or hanging by the pool! I almost always have these ingredients in my house and when I pack it to go and wrap it with tin foil, it never gets soggy! 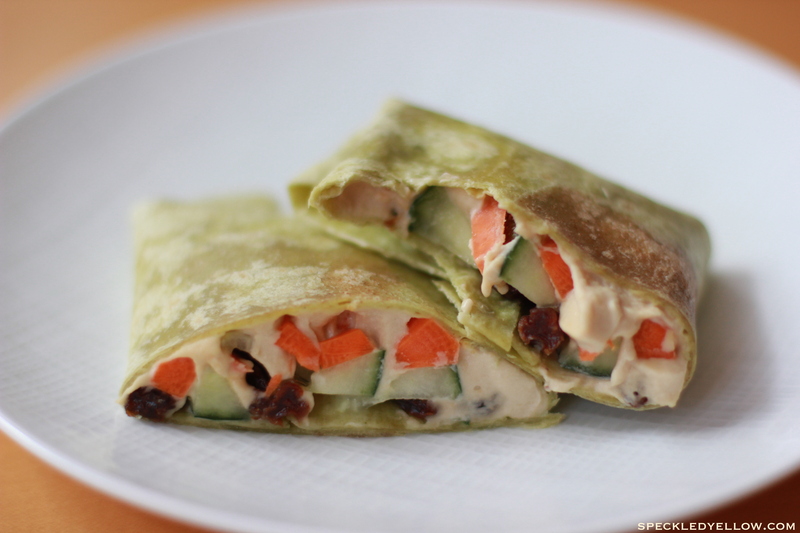 The raisins give the wrap an amazing added flavor, which is my favorite part! This is a must try. It is also a HUGE hit with kids!!!! Last summer after bringing a few wraps to the beach, my friend’s 2 and 5 year-old daughters split one of the wraps. They loved it so much that my friend asked for the recipe and now makes them all the time! *note: Only a small amount of carrot and cucumber are needed for each wrap but I eat the rest or make extra wraps! See below for directions and more pictures!